Now The Mafia Cookbook is reprinted with Cooking on the Lam -- adding thirty-seven original new recipes and a thrilling account of Dogs's recent years since he testified against the Mob in five major trials, all told in his authentic, inimitable tough-guy style. The new recipes are simple, quick, and completely foolproof, including such classic dishes as Shrimp Scampi, Tomato Sauce (the Mob mainstay), Chicken Cordon Bleu, Veal Piccata, Marinated Asparagus Wrapped with Prosciutto, Baked Stuffed Clams, Veal Chops Milanese, Sicilian (what else?) Caponata, Gambino-style Fried Chicken, Lobster Thermidor (for when you want to celebrate that big score), and desserts rich enough to melt a loan shark's heart. Readers can follow these recipes and learn to cook Italian anytime, anywhere, even on the lam, even in places where Italian groceries may be hard or impossible to find. 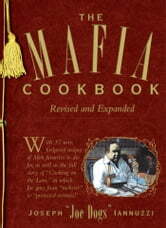 Tested by Mob heavy hitters as well as FBI agents and U.S. marshals, these recipes are simple to follow, full of timesaving shortcuts, and liberally seasoned with Joe Dogs's stories of life inside -- and outside -- the Mob. This is the perfect cookbook for anyone who wants to make the kind of food that Tony Soprano only dreams about.